I posted "Rise Above" in March. 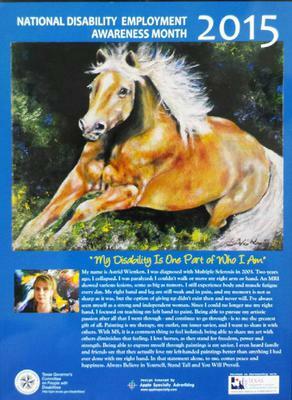 With many friends and family I was encouraged to participate in the NDEAM (sp correction) Art competition here in Texas. Life In Spite Of MS.
Congratulations! How beautiful. Don't know which one I love more. Can you tell us more about the painting and why you chose the horse as your subject? As an artist, too, I love hearing about the reasons people paint what they do. Join in and write your own page! It's easy to do. How? Simply click here to return to Multiple Sclerosis Art.